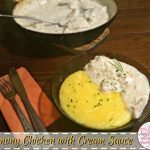 Lemony Chicken Breast with a rich, cheesy cream sauce. So, last week’s theme was to ‘Reduce sodium with lemon”! Thankfully my cooking is relatively low-sodium, but I always seek for new and new ideas, tips to cook healthier, tastier, so all in all cook better. To tell the truth, I found this tip (reduce sodium with lemon – TheLemonBowl) really fascinating. I’d have never thought about adding lemon zest/juice to use less salt, I mean I use lemon in some of my recipes, it’s just I’ve never did it on this purpose. It actually works (! ), plus the lemon gives extra flavor and freshness to the meals. Really worth to try! 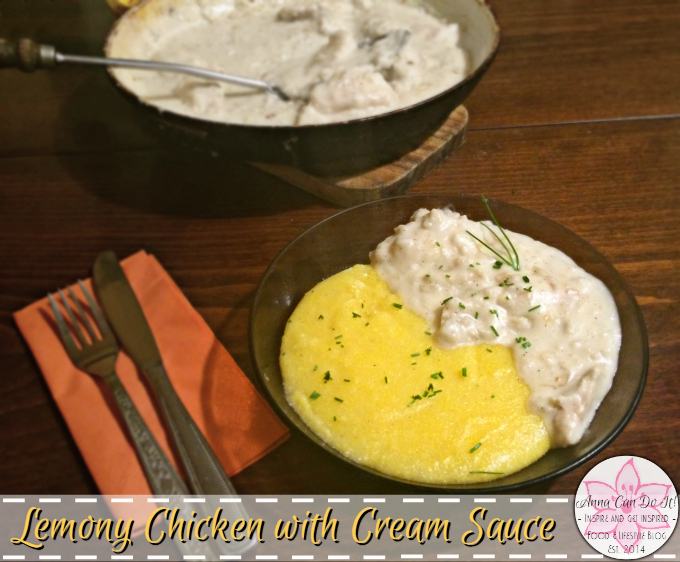 I tried this on one of my favorite ingredient, the chicken breast! Ground the garlic, zest the lemon and add the juice to the chicken slices. Pre heat a little oil in a pan, then sauté the onion. Cover every piece of chicken with flour. Put the chicken to the pan and fry until the flour on (and under) the chicken turns golden brown. Mix the salt, pepper, chilli with the sour cream and 1-2 cup of water. Pour the sour cream mixture onto the chicken. I served it with polenta and it was a really great pairing. I think the chicken and the corn just works well together. This week’s theme is ‘Healthy game day snack’. I won’t be easy since we don’t have game days, so we don’t really have snacking habits, but healthy snacks do sounds interesting. I can’t wait to find some healthy snack idea! What do you think about chicken-corn pairing? What is your favorite healthy cooking tip/hack/idea? Have you ever tried to use lemon to reduce sodium? Do you have favorite healthy snack?